We are happy to humbly term our discussion group with Pulitzer Prize-winning American journalist Loraine Adams a resounding success, with most of those gathered proudly showcasing their verbal animation skills! Ms Adams may now be known to many as a critically acclaimed novelist. However, her extensive career in political and investigative journalism means that behind the creativity lies a woman with a solid understanding of US foreign policy, especially within the global war on terror context. Significantly, she believes that despite the recent regime change in Washington, Pakistan remains immensely vulnerable in the face of the world’s largest military machine. And this really sums up the reason behind Ms Adams’ visit. Viewing fiction as the best means of engaging the reader’s imagination – while continuously reiterating a shared humanity – Ms Adams has deliberately chosen to set her next novel in modern day Lahore. Thus she aims to use the reader-character relationship as a vehicle to debunk the many false or distorted stereotypes about this country and its people. Such efforts must not only be welcomed, but be seen for what they are: Ms Adams’ personal contribution to the discourse on Pakistan and its position on the world stage at this critical political juncture. Refreshingly, Ms Adams is not bashful when it comes to recognising that she, as an American and also as a Pulitzer Prize winner, is taken seriously when engaging in such dialogue. Equally refreshingly, this does not stop her from trying to seek out the entire octave range of the Pakistani voice. For she does not believe in speaking for people, but in listening to them. This is why she asked those gathered to fill in any gaps in her research approach. Thus the discussion leapt from the real or imagined Western media bias against Pakistan to insistent requests that she visit Old Lahore. Also touched upon were issues of class divisions at the national and provincial levels based, among other things, on language. However, the recurring theme appeared to be the heterogeneous nature of Pakistan and its multiple identities, even though these were, admittedly, restricted to the Muslim realm, with no real mention of minority group identities. Nevertheless, the discussion’s fundamental success was this: what began as a Western-Eastern exchange of perspectives transformed into an exchange of ideas on a human level. And such exchanges must never be underestimated. Lahore Nama would like to thank Ayesha Nasir for the geneorus hospitality and a great venue for this event. MOST people living outside of the old, walled city do not know the names of all the 13 gates. Cynics even claim there are 12 gates and a hole — Mori. 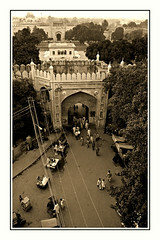 Little is it realised that today the walled city has 14 ‘guzars’ or gates.